On March 1, 2001, the Legacy of Justice Foundation purchased Historic Fire Station No. 2 from the City of Topeka. This beautiful building, conveniently located in downtown Topeka at 719 SW Van Buren, has become the home of the Kansas Association for Justice headquarters. Built in 1927, Fire Station No. 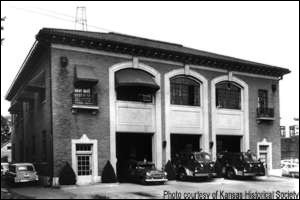 2 served the capital city as a fire station and the headquarters of the Topeka Fire Department until 1979. The building has been designated as a Topeka landmark and has also approved to be placed on the National Historic Register.